My husband and I are young professionals, and we try to make good choices with our money and credit. Almost two years ago, we bought our first place together, a modest townhouse, and combined our bank accounts. Through these processes, we reviewed our credit scores, and we were happy with them. They were quite good, especially considering our short credit histories due to our young ages. Fast forward to now, nearly two years later, and we’re ready to move into a larger house. We knew what we could afford and started looking around with our realtor. Since we were confident in our calculations on affordability, we thought it best to wait for banks to dig into our credit until we were ready to make an offer. We found a place we liked, and the price was right, so that weekend, we submitted our online application for a new mortgage. The following Monday, I received a phone call from the lender. I must have looked like a cartoon character as my mouth dropped open when he told me how low my husband’s score was. What? That couldn’t be possible! He has no loans besides our current mortgage, and we pay our credit cards in full every month, using them only to about 5-10% of our limits. I immediately went to www.annualcreditreport.com and checked all three of my husband’s credit reports. This site allows you to check each of your reports (Experian, Equifax and Transunion) once each year for free in compliance with the Fair Credit Reporting Act, and it’s very simple to use. A good strategy to regularly check your credit is to space these checks out and check one report every trimester to maximize your free opportunities, but in our situation, we needed them all at once. You can always pay for another credit report later in the year if necessary. We discovered there was an error on two of his three reports. It was a collections account for money that my husband owed to an old employer, but we paid it immediately upon receiving it over a year ago and had no prior knowledge of the debt before the collections notice. However, these are considered “serious delinquencies” and will stay on a credit report for seven years if no action is taken against them. It was time to file disputes. We were a bit concerned about disputing, because these errors were technically not fraud. However, we learned that you can dispute items that you own and items that you don’t. In other words, you can dispute items that are technically yours but should not be on your report, like my husband’s collections items, and items that are fraudulent and are in no way legitimately connected to you – not yours. We opted to file our disputes online with each of the two bureaus that displayed the collections account. To do this, we went to each of their individual websites and located the option to file a dispute. We chose the option to file a dispute for an item that my husband owned, and we had a chance to write an explanation of our dispute after answering a couple other questions. You are also given the opportunity to attach supporting documents if you have any. It was surprisingly simple, and upon completing our dispute with each bureau, we received a confirmation email with instructions on how to check the status of the disputes. Each bureau will solve disputes within 30 days unless there are circumstances which require deeper investigation and/or assistance from other parties in the investigation. My online research (fueled by my impatience) revealed that many disputes are solved in about two weeks, although the bureaus will neither confirm or deny this. Fortunately, our disputes were simple and were both solved within one week. And to our relief and surprise, both bureaus deleted the collections account from my husband’s report! We did a quick, free check of his credit score on www.creditkarma.com to see if his score had gone up. This is a soft check, so it does not negatively impact your report or score. The shocking result: his score went up a whopping 80 points! We were appalled to think that an error on a credit report could affect a score that much and prevent someone from getting a loan. Happily, we were able to get our credit rechecked and get everything back on track the way we originally planned for our new house. But had we been checking our credit over the last two years, we could have significantly reduced the added stress of a situation that can already be stressful on its own. The FTC has reported that one in five Americans has an error on their credit report. Our advice is to check it regularly to avoid a situation like ours. Check your credit reports once each year for free. Visit www.annualcreditreport.com to obtain one report each from Experian, Equifax and Transunion every twelve months. If you don’t have credit concerns, check only one each trimester to spread out your free opportunities. If you find a mistake on your credit report, you can submit a dispute online through the appropriate bureaus’ sites (www.experian.com, www.equifax.com or www.transunion.com), or you can submit a dispute via mail. Contrary to popular belief, checking your credit score does not hurt it. You can use reputable sites to check your score using only a soft inquiry, which does not impact your score. (Hard inquires for new credit cards and loans are examples of items that would negatively impact your credit.) Some credit cards, like Discover, include your FICO score with your monthly statement. Non-customers can use this service through Discover’s website as well. Www.creditkarma.com is also a reliable source for your credit score. You may also consider checking your online banking information or asking your bank if they have it readily available for you if you are not comfortable reviewing it online with a third party. No matter how careful you are with your money and your credit, you can never be 100% sure of your situation unless you take steps to be proactive in monitoring it. If you have concerns, talk to your CPA or financial advisor about how you can protect yourself from credit mistakes. Marketing Supervisor – McGowen, Hurst, Clark & Smith, P.C. 529 plans, which are tax-advantaged saving plans used for higher-education expenses, have grown in popularity since they were first introduced in the late 1990s. In fact, many of you might already have them for your children or grandchildren. While it is pretty well known that these plans allow savings for college and post-secondary education to grow tax-deferred and allow for tax-free withdrawals for qualified expenses, this blog post is going to focus on some of the lesser known features of these plans. Every state sponsors at least one version of their own 529 plan. This article focuses on the features and benefits of Iowa’s versions of 529 plans – College Savings Iowa & the IA Advisor 529 Plan. While the most common owner (also referred to as the participant) of 529 plan accounts are likely parents and grandparents, almost anyone can open a 529 plan account. In order for Iowa taxpayers to qualify for the State of Iowa tax deduction allowed for contributions to Iowa 529 plans, you must be the owner of the account. You can be the owner for multiple 529 plan accounts with each account listing a different beneficiary. For 2017, Iowa taxpayers can deduct up to $3,239 in contributions to Iowa 529 plan accounts per beneficiary. That means if a husband has two accounts – one for each of his two kids, and his wife has two accounts – again, one for each of their two children, they could potentially deduct up to $12,956 (4 x $3,239) in contributions for 2017. Another example, grandparents who have accounts set up for each of their six grandchildren could potentially deduct up to $38,868 in contributions (12 x $3,239) for 2017. It’s important to note that there is not a Federal income tax deduction for contributions to 529 plans. Additionally, to qualify for the Iowa tax deduction, you must be an Iowa taxpayer and contribute to a College Savings Iowa or IA Advisor 529 Plan account. The owner retains control over the account and has the right to make the investment selections. The account owner also has the ability to name a successor owner (and in some cases transfer the ownership) as well as the authority to name and change the account beneficiary. The beneficiary does not have to live in Iowa. The beneficiary does not have to be related to you, and you can even name yourself as the beneficiary. You can transfer a portion or all of the account assets at any time to a new beneficiary. 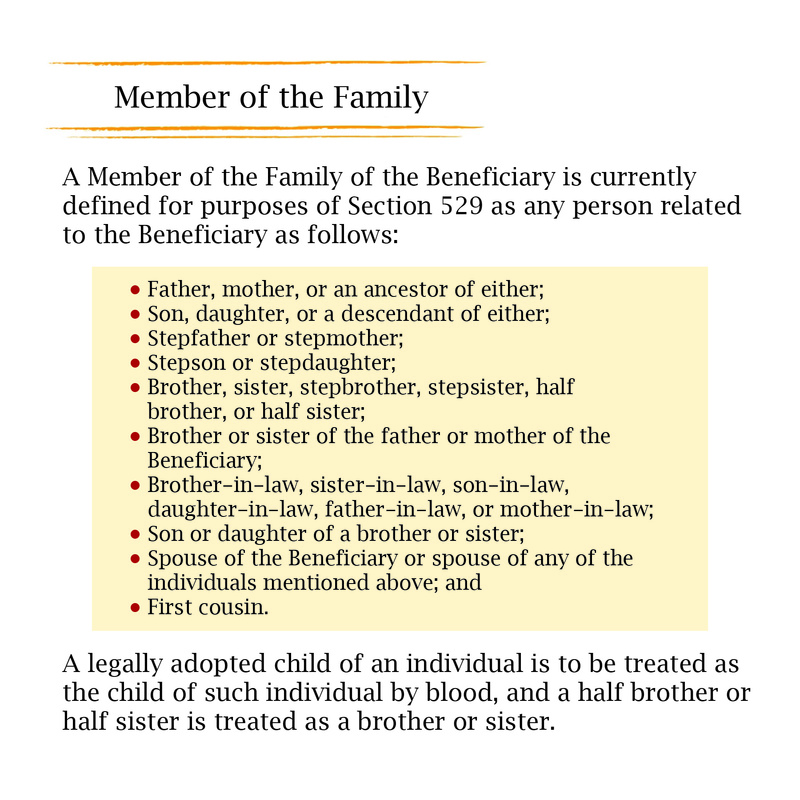 The new beneficiary just has to be an eligible “family member” of the original beneficiary. So if the original beneficiary decides college isn’t for them, you can easily transfer the funds to a new beneficiary. As you can see by this table – the “family member” definition is pretty expansive. The aggregate maximum that the same beneficiary can have across all State of Iowa 529 plans that they are named as beneficiary to is currently $420,000. There’s virtually no waiting period to withdraw the funds other than the reasonable time frame required to ensure that the deposits clear. Why’s that important? It means that instead of paying out of pocket for qualified expenses, you can deposit that amount into a new or existing 529 plan account – qualify for the State of Iowa tax deduction – then use the funds right away to pay for eligible expenses. There’s also no age limit to use. Want to enroll in college after you retire? No problem – you can use funds from your 529 plan account toward qualifying expenses. Certain expenses for special needs students. While there is a 10% federal tax penalty – in addition to income taxes – on earnings if the money withdrawn isn’t used for qualified expenses, there are several important exceptions where the account assets can be withdrawn penalty free. If the beneficiary receives a scholarship, an amount up to the scholarship amount can be withdrawn penalty free. Penalty free withdrawals are also available if the beneficiary enrolls in an eligible U.S. military academy, becomes disabled or passes away. Once the beneficiary of your 529 plan is ready to start their higher education experience, it is important to have a plan for withdrawals. For example, if a beneficiary has both a parent-owned 529 plan account and a grandparent-owned account, it may be beneficial to take withdrawals from the parent-owned account in the earlier years of college, while waiting to tap into the grandparent-owned account until the later years. The reason: financial aid eligibility. Funds distributed from a non-parent owned account are treated as untaxed income to the beneficiary – which will increase the beneficiary/student’s reported income on financial aid forms. Assets held in parent-owned accounts are considered as the parental assets. Parental assets hold less weight in determining financial aid awards than the assets of the student. Withdrawals from 529 plan accounts can also affect your eligibility to take advantage of other tax incentives, such as educational tax credits. You cannot “double-dip” and use the same qualifying expense(s) for both benefits. For this reason, it is important to consult your tax professional and make sure that you plan for the full implications of any withdrawals. 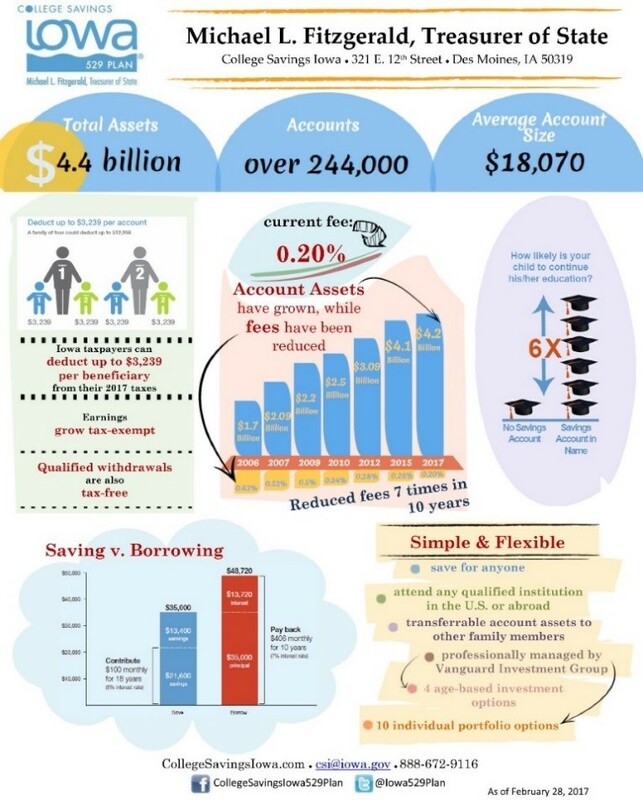 It’s easy to set up a 529 account through collegesavingsiowa.com. However, if you’re not comfortable doing it yourself, you can work with a financial advisor to open an Iowa Advisor 529 Plan. Both plans offer the same benefits to Iowa taxpayers. The information contained in this article was necessarily brief and is not intended to be taken as advice for anyone’s individual situation. To determine the best action plan for your individual situation, consult with your tax professional. For more information, visit collegesavingsiowa.com. You are currently viewing the archives for April, 2017 at McGowen, Hurst, Clark & Smith.